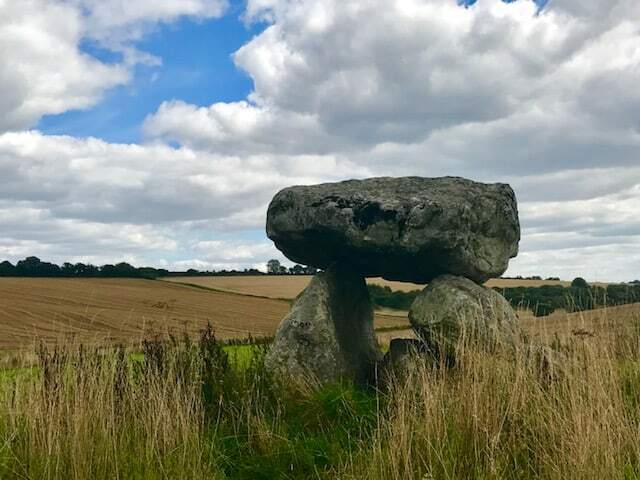 The Devil’s Den is a stunning feature of Wiltshire’s ancient landscape, set in a beautiful location on Fyfield Hill near Marlborough. However, much like this walk, there is something of the curate’s egg about it with a few unfortunate aspects to offset the good parts. The Den originally formed the burial chamber of a neolithic passage grave, much like nearby West Kennett Long Barrow, but the associated barrow has been lost to erosion (and perhaps ploughing?) over the centuries. Even as recently as the 1920s, the mound behind the stones was reported as being 230 feet long, but now all that’s left is the stone infrastructure – two supporting stones, several fallen ones and a massive capstone (reputedly over 17 tons). The stones were “reconstructed” as a dolmen in 1921 but this was done in a less than ideal manner – as witness the crude concrete at the base and the slightly concerning angle of the stones! What might it look like had it been preserved intact or restored more sympathetically? To get there, take the turning off the A4 (marked “Manton House and Hollow) and drive to the car park at the end of the road. Head northwest on the byway round the bottom of the gallops, then turn left at the T-junction into the area of Access Land. This bridleway will bring you downhill (there are sometimes livestock in this field) into Clatford Bottom where you need to turn left once more at the intersection with the footpath. The Den will now be in front of you, nestling in its valley and surrounded by its own little enclosure and meadow. Take time to admire it before heading out on the bridleway to the A4. Here come’s the unpleasant bit of the walk – a couple of hundred yards back up the A4. There’s a pavement along the south side of the road, but it’s clearly not used very often and you feel uncomfortably close to some very fast traffic. Opposite the road south to Clatford, there’s a byway up the hill past Elm Tree Farm and this will take you back up to the car park, mercifully away from the main road. With the arrival of Christianity in the British Isles, many ancient artefacts were condemned as being the Devil’s work and it’s still said that if you pour water into the hollows on top of the capstone, Old Nick will come to his Den in the night for a drink. Alternatively, watch out for steam rising from the capstone (as on a bright autumn morning) – a sure sign that Lucifer is at home boiling his kettle.